A "quick look up guide," Electricity Cost Modeling Calculations places the relevant formulae and calculations at the reader's finger tips. In this book, theories are explained in a nutshell and then the calculation is presented and solved in an illustrated, step-by-step fashion. A valuable guide for new engineers, economists (or forecasters), regulators, and policy makers who want to further develop their knowledge of best practice calculations techniques or experienced practitioners (and even managers) who desire to acquire more useful tips, this book offers expert advice for using such cost models to determine optimally-sized distribution systems and optimally-structured power supplying entities. 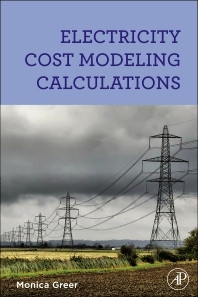 In other words, this book provides an Everything-that-you-want-to-know-about-cost-modelling-for-electric-utilities (but were afraid to ask) approach to modelling the cost of supplying electricity. In addition, the author covers the concept of multiproduct and multistage cost functions, which are appropriate in modelling the cost of supplying electricity. The author has done all the heavy number-crunching, and provides the reader with real-world, practical examples of how to properly quantify the costs associated with providing electric service, thus increasing the accuracy of the results and support for the policy initiatives required to ensure the competitiveness of the power suppliers in this new world in which we are living. The principles contained herein could be employed to assist in the determination of the cost-minimizing amount of output (i.e., electricity), which could then be used to determine whether a merger between two entities makes sense (i.e., would increase profitability). Other examples abound: public regulatory commissions also need help in determining whether mergers (or divestitures) are welfare-enhancing or not; ratemaking policies depend on costs and properly determining the costs of supplying electric (or gas, water, and local telephone) service. Policy makers, too, can benefit in terms of optimal market structure; after all, the premise of deregulation of the electric industry was predicated on the idea that generation could be deregulated. Unfortunately, the economies of vertical integration between the generation.